Both babies are house dogs. They are used to their basket but love the bed more. Sometimes Dolly and Angel are allowed to sleep on the bed most of the time they would make themselves comfortable on the sofa. They love to lay at our feet, even at the dinner table they do behave themselves and just lay under the table till being “spoiled”. Off course there is the once off occasion that they beg. They are used to small children. Dolly is not a fan of small kids but will not nap unless being hurt. Angel will allow any toddler to cuddle her (that is if it is gentle) They are trained to walk with a lead but sometimes they do get out of hand. Dolly will attack any dog coming closer to the family. She is very protective over our boys. Angel is frightened of other dogs barking while walking. She usually stays closer. The reason for Dolly and Angel together is that they are always playing together, laying together and looking for attention most of the times. They are half sisters, sharing the same mother. Waking up in the morning or coming home is a long greeting process. 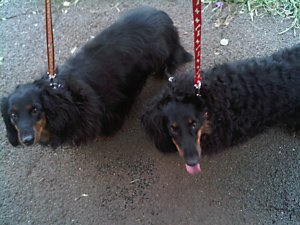 Dolly will bark with excitement and Angel nabbing at your feet. They are not naughty dogs digging holes or eating toys, shoes etc. Sadly there are many individuals out there who will adopt for all the wrong reasons. Barking Mad (www.barkingmad.co.za) will handle the adoption, they will have you finish adoption forms and home checks will apply.